There were once Arabian Ostriches. Unfortunately, they were hunted to extinction in the mid-twentieth century. If at risk an ostrich will either run off or lay flat on the ground. But, they can also attack with a powerful kick. Strong enough to kill a lion! They do not bury their heads in the sand. Their feathers are used for dusters. The barbules in the feathers act like’fingers’ to collect dust particles. Ostriches have the biggest eyes of any land animal. Very useful for spotting predators in the distance. Their eyes are bigger than their brains! The ostrich has a lifespan of around 45 years. In a communal nest, a female ostrich can still spot her own eggs. The dominant female gets to put her eggs . Males control a territory of around 20 square kilometers (8 square miles). Ostriches have no teeth. They consume pebbles to grind down food in their gizzards. 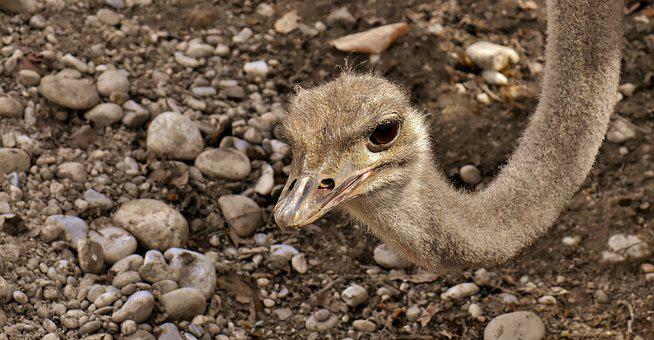 There are around 1kg of pebbles inside an ostrich stomach! Apparently, the taste of ostrich meat is very similar to beef. In some cultures people have ostrich races where they ride them like horses. A good deal of ostrich truth that you realized you wanted to know!